With Brexit still around the corner in what seems to be a never-ending corridor of WTF, shopping over on Amazon.co.uk is still an option for consumers in Ireland. Actually, it looks like it won’t be going anywhere any time soon. I’ll be honest, I fully expected Amazon Ireland to appear in the two years since the UK announced they would be leaving the EU. I’ll admit, sometimes I feel a little guilty about shopping with Amazon. They’re a massive company and quite a few people believe online shopping is killing the high street in local communities. Unfortunately, we can’t always focus on shopping with local stores and we need to go shopping online. Having these two options of shopping online with Amazon or shopping with a high street store, I’m left asking these two questions. Do I need it right now or can I wait a few days? Could I save a few bob by buying them on Amazon? If you’re really clever, you can even avail of free UK delivery to Ireland too using some tricks of the online shopping trade. Benefits Of Shopping On Amazon.co.uk? The UK online shopping market is huge compared to Ireland. Don’t get me wrong, us Irish are hefty online shoppers too, but the UK is bonkers for online spending. As a result, the range available online in the UK is amazing. Online retailers offer a huge range of products you could only dream of picking up on the high street in Ireland. Because they shift larger volumes, there’s also a fair chance you’ll pick items up cheaper from the UK. Some online stores are still coming to terms with home-shopping but it’s becoming easier to shop online than traipsing into town. The likes of Amazon, Zara and Mango make shopping online and returning either in-store or by mail really straightforward. In the case of Amazon, their customer care is nothing short of incredible. Back when I started using Amazon I forgot to cancel my Amazon Prime trial and was charged the annual membership rate. That’s about €95. After five minutes on web chat, I was refunded with a full apology. Yes, an apology for my mistake. On another occasion, they covered my Parcel Motel costs for a return, but more on that later. I digress. Shopping on Amazon opens up a world of choice and the piece of mind that they care about customers. Go a step further, and get yourself an Amazon Prime trial to really live it up like royalty with next day delivery (which takes about two days to Ireland). But Isn’t Amazon.co.uk Just For The UK? This is where things get a little interesting. With Brexit just around the corner, this might very well change, but many of the sellers on Amazon.co.uk offer delivery to Ireland. Whether or not there is a charge or not varies between sellers. Others will only ship to the UK, but believe it or not, this is where your biggest chance to save some money lies. When a seller insists on only shipping to the UK, all is not lost. There is a free delivery trick you can use with the likes of Amazon. In recent years, there has been a rake of new shipping partners popping up in Ireland and the best known of these is Parcel Motel. 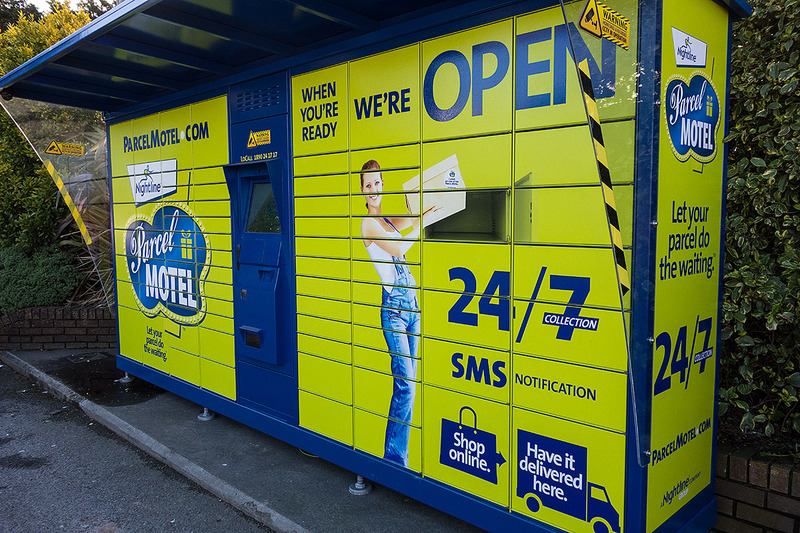 When you sign up to Parcel Motel, they give you a free virtual UK address. You pop this in as your shipping address when shopping on Amazon.co.uk. Parcel Motel will recognise your order and do the rest. The virtual UK address itself is free, but you’ll pay €3.95 per day your package waits in a Parcel Motel. Of course, this delivery trick will work with hundreds of UK stores that don’t deliver to Ireland. How Does This “Parcel Motel-Amazon Free Delivery Trick” Work? Parcel Motel will then ship to Northern Ireland and driver your package to a locker of your choice in Ireland. You’ll pay €3.95 for every day your package remains in the locker. Of course, this is handy when sellers only ship to the UK, but you should always check UK shipping costs. You’ll often save money by choosing free UK delivery to your Parcel Motel over standard delivery to Ireland. While it’s a great service, you do need to know a few things when shopping with Parcel Motel. If you’re shopping around Christmas, give yourself plenty of time. There are limited lockers and if someone doesn’t pick up their package, you could be waiting for space. The lockers also have size restrictions. Big packages or bulk orders might need to be collected from the depot. The delivery date Amazon provides is the date your package reaches Parcel Motel. They will usually take at least another day to get your package to you. There are a few scenarios where you may need to use a Parcel Motel alternative. One particular situation you might yourself in is an Amazon seller not offering delivery to the island of Ireland, or limiting to mainland UK only. The reason why some items cannot be shipped to Northern Ireland comes down to what you’re trying to ship. For example, to get that screenshot I looked at a power bank. Items are usually shipped via air and some postal companies have strict rules against lithium-ion batteries being flown by air. One way around this is to use An Post’s AddressPal service. Parcel Motel works by using an address in Northern Ireland. AddressPal uses an address in England, which means the first leg of your delivery never leaves England. Technically, you shouldn’t be able to get smartphones or power banks delivered via AddressPal either as they’re restricted items, but I’ve heard from many shoppers who’ve received their packages no problem at all. That’s as close to an endorsement as you get. Will Amazon Ireland Ever Be a Thing? Given time, it will be impossible for Amazon to ignore the value of entering the Irish market. With the now inevitable Brexit visible on the horizon, it’s likely that Amazon Ireland will be a thing sooner rather than later. It’s hard to tell just how virtual UK address providers will last through Brexit, so it makes sense for Amazon to set up shop in Ireland. You can sign up to Amazon Prime Video in Ireland right now. This is actually Amazon’s only official service to Ireland right now. If you have any questions all of this craic, pop them into the comments below. Amazon.co.uk is the example all online retailers should follow. From price to offering to customer care, they nail it all. Parcel Motel is the best of many virtual UK address providers out there, but sometimes the lockers can be a little restrictive. Parcel Motel is generally the quickest of the lot so it is a balancing act. Finally, the combination of the two brings with it the free shipping trick. This trick will likely save you money, or at the very least open up a new range of products for you to buy.